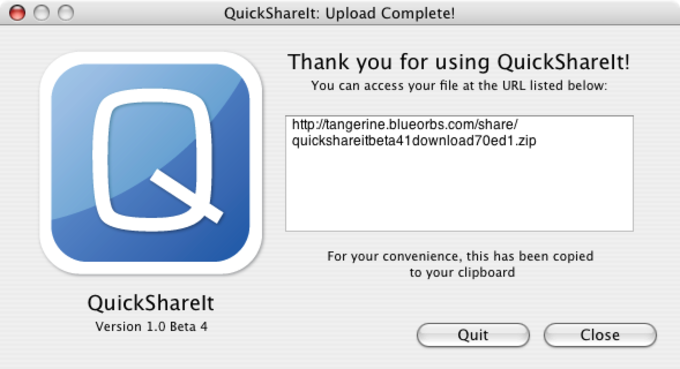 QuickShareIt is a popular, trial version Mac program, that is part of the category Internet software with subcategory P2P Filesharing. Since the software was added to our catalog in 2007, it has reached 9,698 downloads, and last week it achieved 15 downloads. About the download, QuickShareIt is a not that heavy software that doesn't take up as much storage space than the average program in the category Internet software. It's a very popular program in India, Indonesia, and Nepal. It's available for users with the operating system Mac OS X and previous versions, and you can download it only in English. The current version of the software is not available and was updated on 3/21/2007. Quicker and more convienent than ImageShack, YouSendIt or anything else! What do you think about QuickShareIt? Do you recommend it? Why?